Yes, I’m a stylist; but even stylist can use a hand and some feedback. My roomie and I have had some pretty great Groupon adventures this summer (shout out to Groupon because we’ve collectively had fun for $10 each!) and yesterday we added to the fun by going to see “Let’s Be Cops” at the Grand Arena movie theatre. My outfit started off as crop top, khakis, jacket. But at the subtle advice of my roommate (she broke out singing Paula Abdul – as I was giving “Paula”), I nixed the jacket and went with my leopard print trapeze tank (I LOVE animal print) and leopard slides. it’s not too matchy. 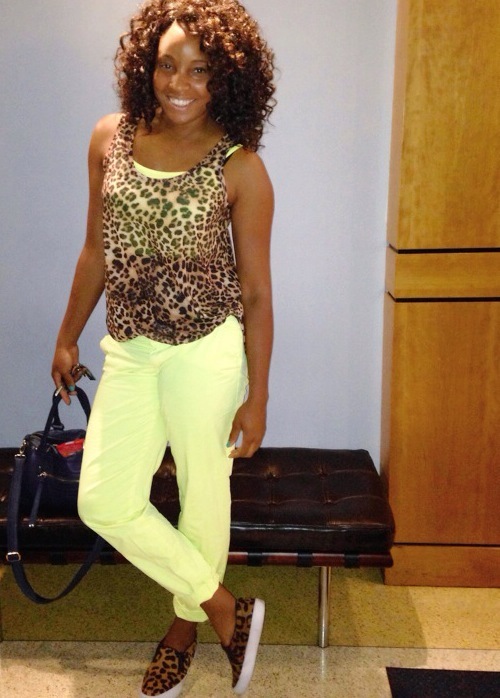 I know how you like the animal print, plus it breaks up the neon, and the white soles give the outfit a “pop”! Thanks Pom!!! It was great advice I loved the outcome. It’s great to give style advice and tips, but it’s dope to receive it as well. Previous Is it Fall or Nah? !